A compass is, without a doubt, one of the most crucial pieces of equipment in any survival situation. The ability to navigate with a map and compass is an extremely important skill. Unfortunately, many people do not know how to use and how to choose the best survival compass for their needs due to technology like GPS. Some people forgot how to add ever since the pocket calculator was unleashed. Not impressive! No doubt, GPS is handy, but if your battery dies or you do not get a satellite signal, it is nothing but a piece of junk. Due to this, it is wise to make sure that you have a solid compass in your hiking/camping backpack, survival kit, or bug out bag. Click to one of the links to go directly to our overview, opinion, and specs of each compass. 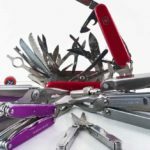 Compact and Lightweight: It is always best to buy compact and lightweight survival gear, and this applies to compasses as well. You will want something that you can easily pack inside your backpack or carry in your pocket. This is one of the first features you should consider when choosing a survival compass. Solid Construction: A survival compass with a solid construction is a must. It should be able to withstand even the roughest conditions. Pick a well-built, durable compass so that even if you drop it, which you definitely will at some point, it does not get damaged. Water Resistant: There is no telling if you may have to swim across a river or it suddenly rains cats and dogs during an outdoor trip. Even Longmire had to walk across a river at the end of season 4! Your compass should be water resistant and waterproof so that you do not have to worry about damage even if you are soaked through. Dry vs. Liquid Compass: Nowadays, you will find dry and liquid compasses both have their own pros and cons. The type you choose depends on your needs and preference. If you pick a liquid compass, make sure that it has non-freezing fluid. Fixed vs. Adjustable Arrow: You can choose a compass with either a fixed or adjustable arrow (no, you cannot shoot this like a bow and arrow!). Again, this depends on your personal preference and needs. 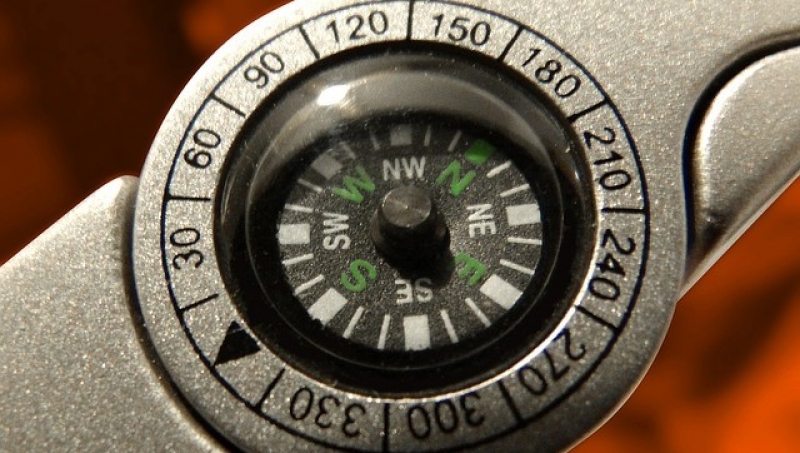 Most outdoor enthusiasts choose a compass that has an adjustable arrow. Rotating Bezel: Also known as an azimuth ring, a rotating bezel marked with 0 to 360 degrees encircles the needle capsule’s outer edge. When the interval of degrees is smaller, it is easier to navigate precisely. Good Baseplate: A compass that has a decent baseplate with measurements to calculate distances is critical. This transparent flat base has a number of navigational markings, such as a ruler that you can use to measure map distances. Orienting Arrow and Meridian Lines: You should make sure that the compass you choose has orienting arrows and meridian lines. The markings on the baseplate and inside the needle housing are helpful for a number of basic navigational tasks. Without these, orienting your compass to a map will be extremely difficult. Declination Scale: A more sophisticated orienting arrow, this is a feature that every capable compass for hikers and other outdoor enthusiasts should have. This helps you in adjusting the readings of the compass to reflect the “magnetic declination” in your travel area, which is the difference between magnetic north and true north. Clinometer: For backcountry skiing and mountaineering, a compass that features a clinometer is an excellent choice. It helps you in assessing the steepness of a slope as well as avalanche hazards as you climb. Sighting Mirror: If you want more precise navigation or to travel off-trail, you should choose a compass with both declination adjustment and sighting mirror. This helps you sight an object or direction simultaneously with the compass capsule visible. Global Needle: Whether you are a global traveler or going on a trip south of the Equator, you should get a compass that features a global needle. It compensates for variances in the magnetic field of the Earth and works accurately no matter which part of the world you are at. Yes, this compass can help you find the nearest Burger King! Magnifying Glass: You will find some compasses that have a magnifying glass set into the baseplate. 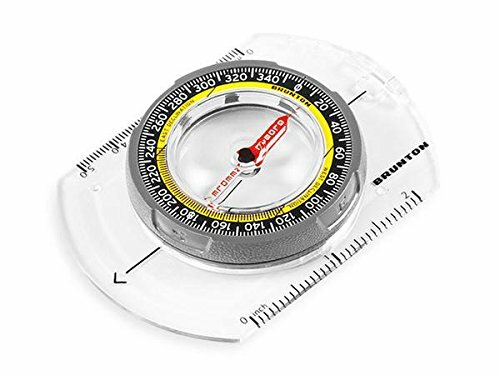 These compasses are useful as you can use the magnifying lens to read small texts on a map. Luminescent Indicators: This feature allows you to read your compass at night. These indicators could be on the orienting arrow, magnetized needle or the four cardinal points. This is a survival compass that should be part of your gear. With its global needle, it will work extremely well in the northern as well as southern hemisphere. The Suunto MC-2G has a small magnetized disk, instead of a magnetized needle, which is placed on a gimbal attached to the needle. This helps in preventing the needle from hitting the bottom of the compass when you are traveling in the southern hemisphere. Also, the compass dampens faster, which means that you do not have to constantly conduct bearing checks. The Suunto MC-2G also has a glow-in-the-dark dial which is ideal for nighttime travel as well as an inclinometer for measuring various angles, heights, mountains, and cliffs. Opinion: We really like the Suunto MC-2G because of its quality, we think is an excellent compass to have. The luminous bezel feature is a great addition and the ease of use make it a solid option to consider. It’s also worth mentioning its accuracy in both the northern and southern hemispheres. If there was anything we would like to change, it would be the size of the magnifying glass – a little too small to be useful. Other than that, we have no complaints. Although it is a little pricier than other compasses in the market, we have no problem recommending the Suunto MC-2G survival compass to anyone in need of one. No Dumb and Dumber should not purchase one; they should just remain in their home! This is a quality baseplate compass that features a classic bezel, lid, and mirror that has more knurling for better and easier grip and rotation. The one-piece mirror has an etched sighting line down the center so you can always have a precise readout of bearing. The Silva Ranger 515 Compass has everything you need including a declination adjustment, clinometer, map magnifier, and luminous markings for night use. According to Silva, these are 4 times as bright as watches and do not degrade over time. This compass’ has 2-degree gradations on the bezel. If you do not mind having one that is not a hemispheric compass, the Ranger 515 is a poignant choice – it almost gives the Suunto MC-2G a run for its money. Opinion: First, we want to mention that The Silver Ranger 515 is an excellent compass that works accurately and spins easily. If you ask us, we think that it has all the features necessary in a sound compass – except for not being a global compass (and no, this has nothing to do with this compass having an abundant amount of airline travel miles!). It is well designed and sturdily constructed, so you know you have a high-quality survival compass. Apart from the fact that it is not a global compass, there is one small thing that we would like to point out as an area of improvement – the baseplate. We believe that it is too overcrowded with scales. But all in all, we believe that this is a stellar compass for camping, hiking, etc. As long as you are not planning to travel the world, the Silver Ranger 515 is a suitable pick. This is a phosphorescent lensatic compass that has a number of features that work well when you are in the great wide open. 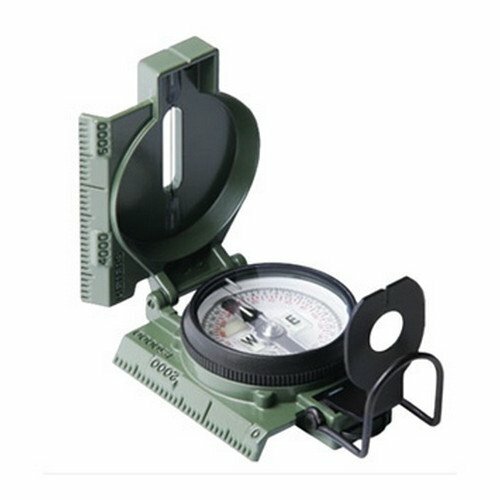 The Cammenga Clam Pack Lensatic compass has been rigorously battle-tested to make it water, shock, and sand proof and is functional from -50 F to +150 F.
It features a sight wire, magnifying lens, mils for accurate readings and dial graduations in both degrees. The clamshell design makes it easy to carry and maintain. This compass has a non-liquid needle housing and a copper induction damping housing, dampening the needle movement for stability. This makes it impervious to temperature as well as bubbling problems. This is an excellent compass for camping, hiking and of course, survival if you do not mind a little extra weight. Opinion: With a military style design, The Cammenga Clam Pack Lensatic Compass is a quality survival compass that will serve you well on your outdoor trips. 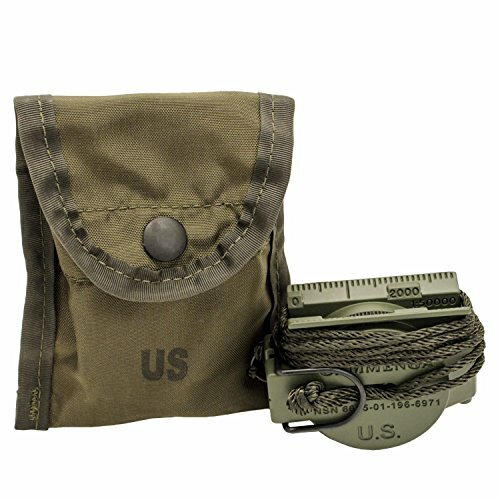 It is a salient addition to your survival kit or bug out bag. If you are in need of serious navigating, we think that this is the compass for you. The product comes with everything you need, including a pouch, lanyard, belt clip, and instructions. No, it does not come with the Assassin’s Creed video game! You do not need that! If there is an area that needs to be improved, it would be to make the lens more securely fixed onto the unit –we think that is prone to fell off very quickly, which is disappointing considering that this compass is not a cheap one. Otherwise, we have no complaints about its quality. Another thing to point out if you are considering to pick one is that the Cammenga Clam Pack Lensatic compass is a little heavier than most compasses out there, but if you do not mind that, it is an excellent choice for all your outdoor adventures. This is a well-designed and well-constructed survival compass that comes packed with all the features you need. It is compact and lightweight and gives you accurate and reliable performance every time. 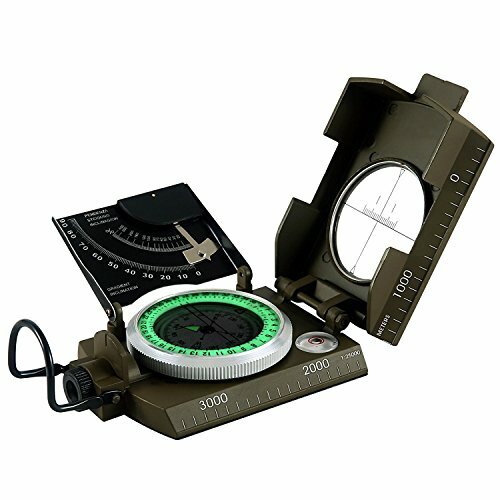 The Eyeskey Multifunction Military Compass is a new model with excellent new built-in features, including a magnifying viewer, floating luminous dial, adjustable luminous marching line, sighting hairline, thumb hold and a rugged metal case and liquid filled for fast readability. It also features a fully-sealed design which makes it waterproof. With its fine workmanship, there is no doubt that the Eyeskey Multifunction Military Compass is a good-looking compass. Opinion: Sturdily built, the Eyeskey Multifunction Military is an excellent choice when it comes to survival compasses. It is a robust unit that can work even under the most rugged and extreme conditions. In fact, many say that it is better than advertised and it would probably even impress Rambo! There is one drawback about its design, and that is the weight, for experienced hikers and backpackers is a tad bit heavy, but if that is not a problem for you, we think you should check it out and see if fit your needs. One problem we noticed is that the needle on their compass’ inclinometer was loose so we would love Eyeskey to change that. It could be a manufacturing defect on some units. But all in all, although it is a little heavy, we still recommend the Eyeskey Multifunction Military compass if you need one for survival or simply camping. This is another hardy, well-made baseplate compass from Suunto. The M-3 G has been designed so that its weight can be balanced for commonly required features such as their renowned global needle. Thanks to this, it is more reasonably priced than the MC-2G compass. Its solid structure is built to last and has a few advanced features without the mirror, which makes the design a little bulky. This compass can be used for both day and night hiking. Apart from being waterproof, the M-3 G can also perform in temperatures as low as -22 degrees Fahrenheit. You will find this compass in a northern hemisphere model as well as two global models with imperial and metric scales. 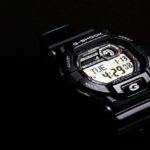 Although some M-3 G models can be expensive, they can support that sticker price. Unlike watching Star Wars: The Force Awakens, that movie was horrendous! Millions of people were ripped off in 2015 for that movie! Opinion: Another great product from Suunto, the M-3 G is a well-constructed, durable compass that meets all the needs of an adventurer. Although some models come with a high price tag, if you take into account its quality, it might be worth every dollar. An excellent feature that is worth mentioning is that M-3 G allows you to make adjustments for magnetic declination. There are some improvements that would make this product a better option, for example, a mirror, but this addition would make it heavier, more expensive, and is just one more thing in your gear that can break (and if this includes your electric toothbrush that is not impressive since electric tooth brushes should not be in your EDC bag!). If you do not mind spitting out a serious amount money on a compass, you cannot go wrong with a Suunto M-3 G.
This is a military-grade compass built to the demanding MIL-PRF-10436N specification. It is put through rigorous tests to make it waterproof, sand proof and shockproof and functional from -50 degrees Fahrenheit to +150 degrees Fahrenheit. The CMMG Tritium Lensatic compass features 7 Tritium Micro Lights that allow you to navigate even in low-light conditions without needing a flashlight or any other source of light. These lights remain luminous for more than 12 years without maintenance. This compass comes equipped with a sight wire, magnifying glass, dial graduations in both degrees and mils for accurate readings. The plastic bezel might disappoint you as it makes the compass look and feels flimsy, but still, this is a superb survival compass if you are in need of one. Opinion: We love military gear! The CMMG Tritium Lensatic compass is a quality built, robust, and very accurate piece of equipment. It is tough and durable, and many outdoor enthusiasts say that they have used it in rough conditions, but it does not get damaged. 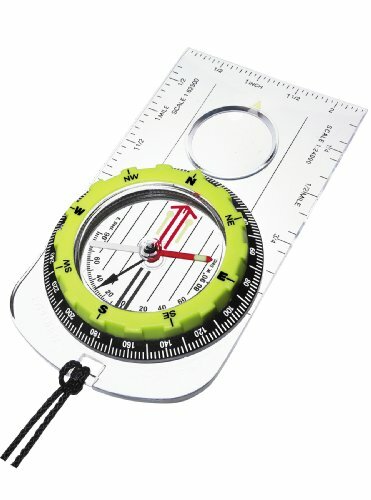 The weight is an issue with this kind of compass– we think it is a tad too heavy for backpacking and hiking. So if you are looking for light gear, this is probably not for you although it is highly recommended. There are some things we do not like, for example, the plastic bevel which makes an otherwise extremely nice compass look and feel flimsy. But on the other hand, the CMMG Tritium Lensatic Compass can take a beating, and it is a great choice for any outdoor or survival situation. The Silva Polaris is a baseplate compass that is unlike any other when it comes to telling direction. Compact and slim, it packs a surprising number of features into its little profile. The needle and construction material are excellent, and with its baseplate layout, the Silva Polaris is very simple to use. Also, the baseplate’s clear markings make it easy for you to read the writing. Both sides of this compass’ body have rulers – millimeter and inch. Keep in mind, however, that although the magnetic declination device comes with a one-time process for magnetic declination accounting, you will need to adjust the readings every time. 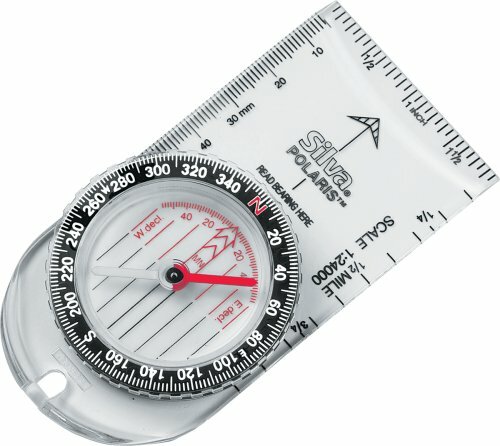 The Polaris compass is not physically reliable for rigorous use, but it is perfect for young scouts and hikers who are in search of fun in open terrain. Opinion: The first thing you will notice is that the Silva Polaris Compass is lightweight and easy to read. Its compact size and slim profile make it ideal for light backpacking and hiking trips. We think that it is exactly what you expect in a good compass. While you may not be able to use it in rough and extreme outdoor adventures, it can get you from point A to point B and made for on-the-move navigation. The only thing that would improve it is to add a lanyard which can be quite handy. 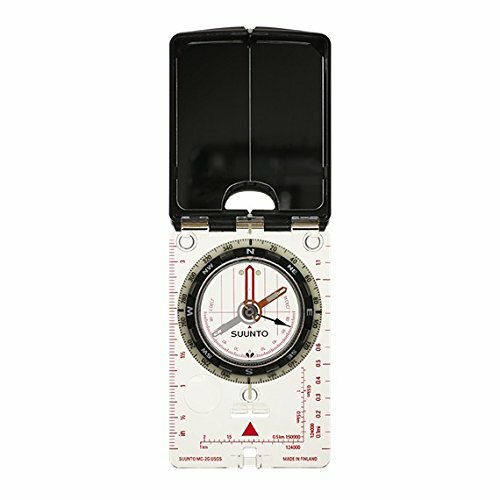 Overall, the Silva Polaris an excellent compass and users recommend it for hikers, backpackers, and scouts. 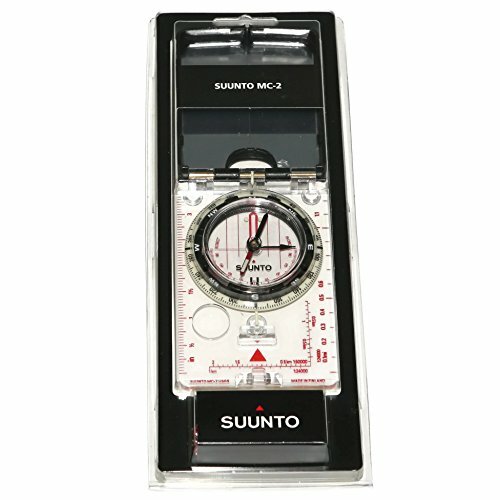 Another notable product from Suunto, the MC-2 360 is a compact mirrored compass that is durable, accurate, and reliable. It features the company’s two-zone system so you can always get reliable readings in the northern hemisphere. The Suunto MC-2 360 also has a fixed declination adjustment system that is perfect for areas with large magnetic variation. Other features include an inclinometer, baseplate with nonslip rubber feet and an additional sighting hole for added precision. It also comes with a lanyard with wrist-lock. 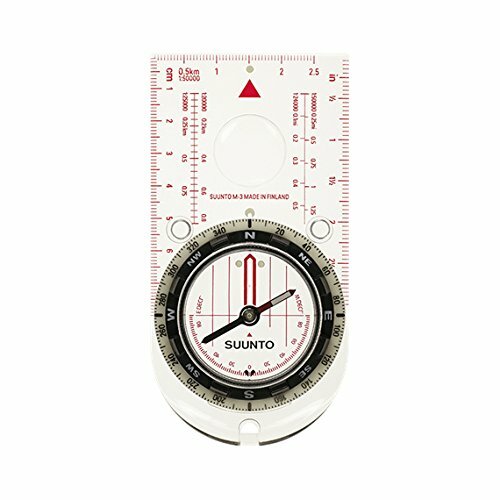 This is a compass that has everything you need for maximum accuracy and easy navigation. Opinion: We think that the Suunto MC-2 360 is an excellent compass that you can trust. It is well built and reliable. What makes it a notable product is its quality materials and features at a reasonable price. Many say that they bought this compass to replace an indestructible old one and have not regretted making the purchase. Another great thing worth mentioning is how accurate it is when you’re using it. The compass housing could be made a little more secure, but most users do not seem to have a problem. If there was one thing we would like to change, it would be the slight offset in the alignment arrow and declination scale indicator – We think Suunto should check their quality control issues. Apart from this, there are no major complaints, and overall, the Suunto MC-2 360 is great value for the money. This is a neat survival compass with a Hi-Vis color that makes it easy to read and find in low light. It features two-degree graduations and a built-in magnifier for map details. The Silva Explorer Pro High Visibility Compass is well designed and well-constructed, making it durable, reliable, and accurate. It also comes with a gear-driven declination scale and clinometer for measuring slope angles. The Silva Explorer Pro High Visibility is an ergonomically-designed baseplate compass that comfortable fits the hand and is easy to use. While there have been complaints about the baseplate design, this is still an excellent choice for a survival compass. Opinion: Let’s begin by saying that the Silva Explorer Pro High Visibility Compass is precise, easy to read and extremely reliable. This is a high-quality compass that is popular among both beginners and experts. We like the quick and responsive needle that comes with it. While the baseplate design might be a problem for some, others have no issues with it. The only thing that we would like to improve is the dial – in some units, it does not turn, so users cannot adjust the declination. This may be a defect in some units, but we think that Silva should check it out to make sure it works well. This is the only major complaint. Otherwise, we believe that if you do not need a lensatic compass, Silva Explorer Pro High Visibility is a really good survival compass. 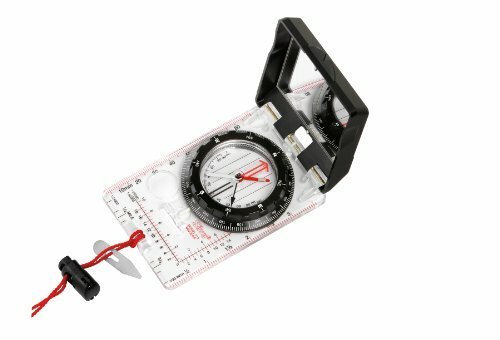 This global compass is a baseplate compass packed with some neat features. It offers high-level precision for even the most demanding adventurer. It features the TruArc Global Needle system and functions in all the hemispheres and magnetic zones. The global needle in this compass is not as drag-free as the Suunto MC-2G, but for its price, you cannot complain. The Brunton TruArc also comes with adjustable declination correction. You can add a lanyard strap which is handy. This is a simple compass without any fancy frills like a magnifying lens, clinometer, etc. but does offer you the convenience of a global needle and adjustable declination correction at an awesome price. Opinion: If you are looking for a top quality compass that comes in a simple, easy to use design, we believe that the Brunton TruArc is a salient choice to keep in mind. It does not come with the fancy features in most compasses today, but for some, this might not be a problem. Well, Madonna and Lady Gaga may mind but since you are not them and you are probably happy that is the case, you have nothing to worry about! Moreover, we think that the global needle and adjustable declination correction are more than enough to serve you on your trips. If there was anything we would like to change, it would be the absence of cardinal points on degree markings. Otherwise, the Brunton TruArc is a reliable, accurate, and quality compass that we would recommend to anyone looking for a survival compass. As you can see, there are a few survival compasses that you can choose from in today’s market. These are reliable and accurate navigational tools that make a fantastic addition to any backpack or survival kit. Just pick the compass that has the features you need, keeping in mind your level of expertise and how long you plan to keep the compass before you upgrade to a better one. The trick to finding a wonderful compass is to focus on which is best for you.